there will always be mystery — things we don’t know or don’t fully understand. She also spoke of Faith…that gift from God which enables us to accept as true, and therefore believe, what the Catholic Church teaches even though we will no doubt encounter mystery. I thought about what she’d written and want to share with you my encounter with a certain mystery in my own effort to know God as best I can. That mystery is the Blessed Trinity — three persons in but one God. I knew very early on that here was mystery big time – something way beyond the boundaries of my limited comprehension. Fortunately I’d been in ‘mystery land’ before and had learned what was the best way for me to handle it. I simply filed the ‘how could such a thing be?’ away in my faith capsule to await explanation in God’s own time along with other truth/mysteries like bread and wine becoming His Body and Blood and Jesus being at the same time both fully human and fully divine. However, I couldn’t help but wonder why God chose to be ‘person’. Could it be His way of giving us some small, shadowed glimpse of Himself even within the darkness of mystery? I began thinking along those lines, not in a way that was unrealistic in human terms, like three in one. No – I just took them one person at a time. God the Father was always a person to me – simple as that. It just made sense. Somebody had to make the first trees and animals and people – had to ‘create the world’ as the Bible stories told me. I had absolutely no problem with the people of the Old Testament talking to God and Him ‘talking’ to them. He helped them escape from Egypt, He fed them in the desert, He interacted with the prophets. Those are the kinds of things ‘persons’ do. Yes, it was very easy to think of Him as a person. Next, within the context of many things, including the intermingling of stories from both Testaments, I came to know a second God/Person. ‘Person for sure’. From my first coming to realize that Christmas was His birthday on through meeting His mother and foster father and relatives and neighbors and friends and enemies, I have been oh so comfortable with what I have come to call His ‘person hood’. After all, He ate and slept and walked and partied and shed tears. On top of all of that He even had a real person name – Jesus. Beyond that I had a problem. I was certain God wanted me to know the Holy Spirit as a person since that is how He revealed Him to us, but no ‘person’ seemed to be emerging for me. In no way was I asking for a miracle or some kind of apparition, I simply wanted my thoughts to lead me in the right direction. So I kept thinking – and praying. Unfortunately, as so often happens, negative thinking took the lead. For a very, very brief time I considered the fact that I had seen both God the Father and God the Son pictured in some artistic way as ‘person’ but never God the Holy Spirit. Fortunately it didn’t take long before I realized the countless flaws in that kind of thinking. It also crossed my mind that the Holy Spirit didn’t seem to have a stand-on-its-own, person-sounding name. 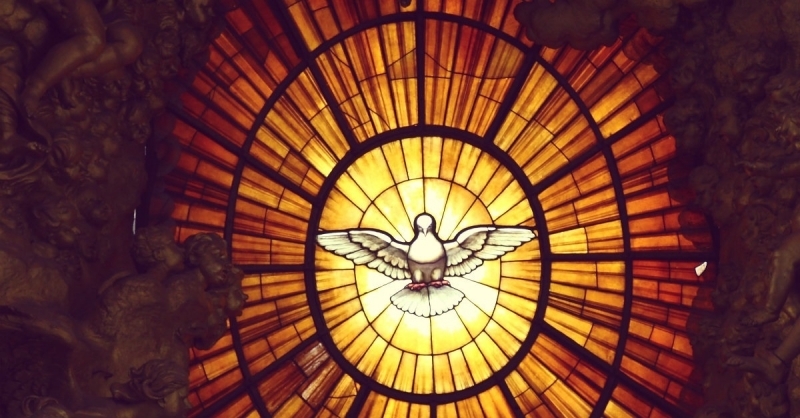 He is called the Holy Spirit or the Paraclete or the Sanctifier each of which sounds more like a position title than a name. Unlike the other two Persons of the Trinity, He didn’t even have a family-connected role name like Father or Son. That reasoning collapsed rather quickly when I thought about all the unsigned pieces of art I’d seen or the “Author Unknown” things I’d read without ever doubting for a second that a ‘person’ was responsible for each one of them.. No — being nameless, faceless or anonymous definitely did not denote – absence of person. Of course, there were also positive things which helped the non-person fog to lift. One which I recall was that the inspired authors of the Bible didn’t use a lifeless sounding word like ‘it’ when they spoke of the Holy Spirit but rather used the ‘person-al’ pronoun — “He”. But, let me skip ahead and tell you what finally brought the person – reality of the Holy Spirit to me. It happened as a result of seeing a friend causing herself great hardship in order to help someone with whom all of us knew, she shared a mutual dislike. Knowing her so well, I was certain God, at some time, would had to have given her whatever it was she needed in order for her to do ‘what Jesus would have done’. I asked myself, “Every time I run up against things I know I should do and yet I sure don’t want to do, what are the God-given, use-when-needed gifts which will offer me the inclination, the willingness and all else which will enable me to do what is right?” The word ‘gifts’ triggered the answer and it lit up in my brain like a neon sign “GIFTS of the Holy Spirit”. That was the clincher. Remember what I said earlier about why it was comparatively easy for me to think of God the Father as a person – because He did “the kinds of things persons do” – giving gifts is “the kind of thing persons do”. That is how the third person of the Blessed Trinity stepped into my life and, pray God, took up permanent residence. All of this probably makes about as much sense to you as high fever rambling. I’m sorry. I merely wanted it to be a reminder that, although each one of us is traveling on her own individual path of faith, we can all be certain that, in some mysteriously wonderful way, we will be accompanied, guided and helped by three very real, very understanding, very loving PERSONS.